Red tide has been ravishing our wildlife in recent weeks. Hundreds of sea turtles have been washing up dead on the shores of Southwest Florida. Many of them are breeding age adults which could have long term effects on sea turtle populations in our area. 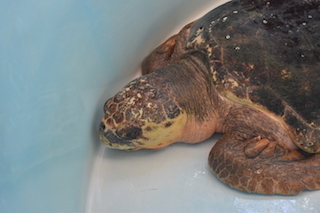 This adult male loggerhead (#18-3223) washed ashore on the evening of August 13 in Naples, Florida. He was transported to the #CROWClinic the next morning by the Florida Fish and Wildlife Conservation Commission. He is very weak and lethargic with no obvious signs of trauma. He is suspected to be another case of red tide poisoning. 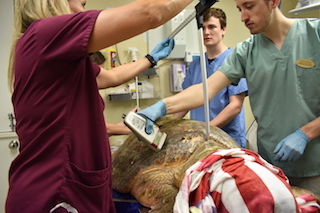 Veterinarians performed an initial intake exam upon the turtle's arrival. During this exam, they do things like take shell measurements, check for any tags, check his heart and breathing rate, check inside his mouth, check his eyes and take radiographs. He was also weighed in at 95 kilograms (about 210 pounds). Blood samples were taken to help determine a treatment plan and to send out for testing of toxin levels. They did not find any obvious signs of trauma and based on clinical signs believe he is sickened by red tide. Once the intake exam was completed, veterinarians made a treatment plan and provided initial treatments. 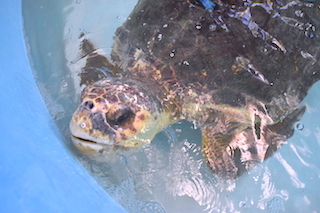 These treatments included iron and B12 injections for anemia, antibiotics for possible pneumonia (a common secondary issue with red tide turtles), fluid therapy to support the liver and kidneys while processing toxins and a novel treatment as part of an ongoing study. The turtle will remain dry-docked for the first critical 24 hours while receiving treatment before being placed in a shallow freshwater tank. The turtle was moved into a shallow freshwater tank today after spending the last 24 hours dry-docked. He is started in this shallow tank so if at times he is still lethargic, he won't drown. Staff will monitor him in the tank and raise the water level as he becomes stronger. The freshwater helps kill any epibiota, such as barnacles or algae, that are growing on his shell. He will be reintroduced to salt water over the next couple days. After spending a few days in the shallow tank, rehabilitation staff have gradually increased the depth as the turtle has showed signs of improvement and he has been swimming well around the tank. They have offered squid and fish, but he has yet to eat. Sometimes, it may take a few days before a turtle will regain its appetite. 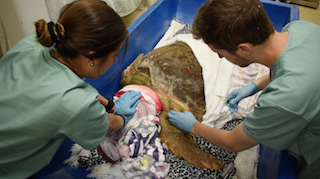 The male loggerhead has been eating small amounts, but has yet to fully regain his appetite. 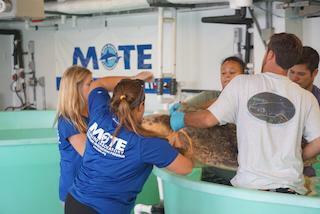 He has been cleared for transfer to Mote Marine Lab in Sarasota to continue his rehabilitation. Once he is ready for release, he will receive a satellite tag so his movements will be able to be tracked. 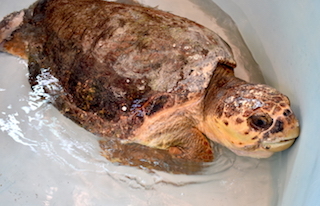 The adult male loggerhead was transferred to Mote Marine Lab this morning. He will continue his rehabilitation at their facility until he is ready to be released. It is the hope that once he is cleared for a release, he will also receive a satellite tag to be a part of Mote's study on male sea turtle movements. We will continue to update on any information we hear about his progress. 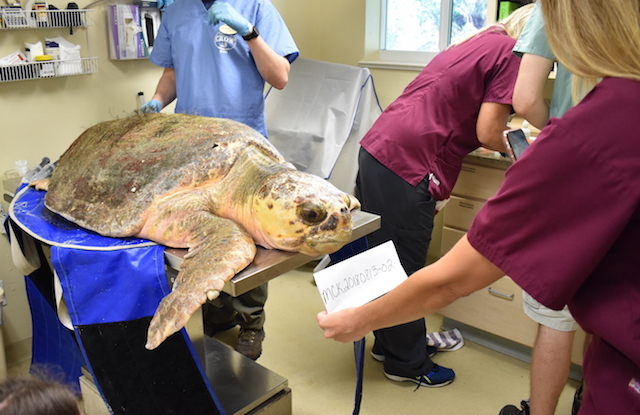 The adult male loggerhead, who was named Banner, was fitted with a satellite tag by Mote Marine Lab staff before being released in Naples, Florida this morning.